Winter may still be a couple of months away…aww, who are we kidding? It’s Colorado! While we have actually had something of a fall over the last few weeks, winter could show up tomorrow and send us well below freezing. So with the coldest days not too far away, it’s time to start looking at what you should do in order to prevent all of your outdoor pipes from freezing. It’s the surest way to prevent calling an emergency plumber in December or having to have a plumbing contractor fix your outdoor pipes when spring comes. When winter is on its way, make sure to drain you garden hose so that it doesn’t burst when the water inside freezes. Storing it in your basement or garage is the most thorough way of making sure it doesn’t suffer through the winter. After all, just getting it away from the harmful UV rays of sunlight for the next five months could go a long way to helping it last many more years. What does your garden hose hook up to outside? It has so many names, including spigot, sillcock, bib, or wall hydrant. The most thorough way of ensuring that outdoor spigots make it through the winter is to turn off the water to that particular spigot indoors and then open the outdoor valve. After it drains, leave the outdoor valve open; if you leave it closed, perpetual drips from a faulty indoor valve could build up and cause your pipe or outdoor spigot to freeze. When spring comes around, you’ll be using harsh language it if it starts to spray into your basement! Maybe you do it yourself, maybe you have a nice neighbor, maybe you hire one of the many companies that have compressors to come and blow out your sprinklers. Now is the time to have your sprinkler systems blown out. Your grass doesn’t need the water anymore, and you want to get it taken care of before that first heavy freeze. In most cases, sprinkler pipes are safely below ground, and that constant temperature tends to prevent them from freezing. 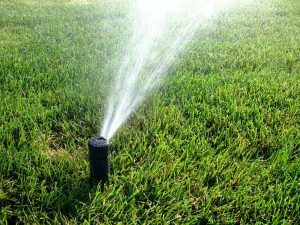 But the sprinkler heads are susceptible to freezing, and the pressure vacuum valves at the sprinkler station are likely to freeze and break, causing at least a $100 dollar repair. Getting your sprinkler system blown out will save you a lot of trouble this spring. In-ground home pools aren’t really that popular here in Colorado. While they’re a status symbol in some parts of the country and incredibly common in others (think Florida and California), pools never really caught on in Colorado, most likely because of the short swimming season. But if you do have a pool, make sure to drain the water from it and its water supply lines. Failing to do so could cause damages that will cost thousands of dollars. Winter is never far away in Colorado, so it’s important to take care of all of your outdoor pipes and water fixtures before it starts to freeze. If you need any help, contact your local plumbers here at Garvin’s Sewer Service and we can make sure you won’t be cursing when spring rolls around…in May or June!